Emmegi (UK) has made several new service appointments as part of a major overhaul of its service and installation department, and in line with its planned focus on service throughout 2019. Kully Hunter has joined the Coventry based aluminium machinery specialist as Service Manager, taking over from industry veteran Jeff Rooke who retired at the end of 2018. Kully has many years’ experience in a similar industry role and is introducing new structures and processes at Emmegi (UK) which will make the company more responsive and more efficient across all aspects of servicing. She is already implementing new initiatives, such as an increased use of the remote tool Team Viewer to give customers a quicker diagnosis of software related machine issues with the possible option of a quicker and cheaper remote repair. She is also managing the team of service engineers from Emmegi in Italy who have been contracted to provide specialist technical support to customers in the UK throughout 2019. 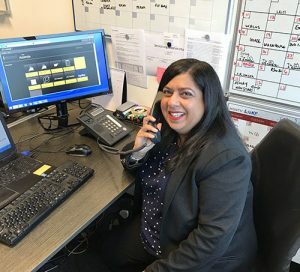 In the short term, Kully says that her focus is on addressing urgent breakdown and warranty calls for customers, but that she plans to put in place a programme of proactive measures which will improve the whole customer experience from requesting a service visit to scheduling a new machine installation. In addition to Kully, Emmegi (UK) has also appointed three new service engineers for the North, Midlands and South of the UK to work to work alongside its experienced Engineering Manager Gary Bearhead. The company is now actively recruiting another service engineer to join the revitalised team and benefit from the comprehensive training package provided by Emmegi both in the UK and in Italy.